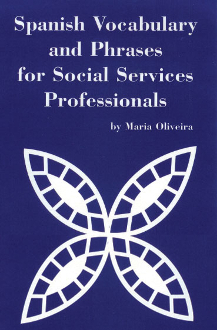 The "Spanish Vocabulary and Phrases for Social Services Professionals" contains 13 lessons designed to create a more productive interaction with Spanish speaking clients. This program is convenient for students who enjoy flexibility so they can study independently and on their own schedule. The content of the program aids memorization when the student listens and repeats the lessons. The included booklet provides visualization of the new words and phrases. The combined audio lessons and Booklet is a valuable asset for any Social Services staff member who wishes to improve service to clients with limited English language skills. The lessons provide useful Spanish questions for obtaining important information needed in emergencies, during screenings and in routine interviews; determine living expenses, income information, legal status, family relationships, and more! Reduce confusion and enable vital communication, save time in a crisis, and improve efficiency with Spanish Vocabulary and Phrases for Social Services Professionals. Employers will take note of such efforts as well! Upon completion of your order you'll be issued a link to access the files. the program will be available to download for 3 days and 3 attemps. After that link will no longer work.